Jupiter is a wild world. It has continental plates floating in the upper atmosphere that contain land area equal to several dozen Earths, and much of that land area is untamed and inimical. The planet's population is well into the billions, but there's so much space that they remain hidden in scattered locations throughout the dense jungles that make up most of the inhabitable regions. There's plenty of room to get lost in and lots of things that want to kill you, and it takes someone really special to be able to claim to rule it all. Jovian society is highly matriarchal. There is a population imbalance, and the women outnumber the men several times over. Many of the roles held traditionally by men in other societies are filled by women on Jupiter. Add in the environment, and the end result is that Jovian women are tough, and they like a good fight. However, they are women and proud of it, so men are not the second-class citizens of Amazon myth. The dream of every Jovian girl is to find a man who can keep up with her and watch her back in battle as a true partner should. The fiercer the guy, the cuter she thinks he is. The high point of the Jovian year (which is just under 12 Earth-years long) is the Grand Tournament. This is a chance for the unmarried women of Jupiter to show their stuff, and win fabulous prizes. It's also a time when Jovian men stay far, far away from the capital. That's because unattached men have been known to be kidnapped and added to the grand prize, becoming the husband of the winner by royal decree. The tournament itself is a test of strength, endurance, fighting skill and courage. It's been described as very similar to the summer olympic games... if they'd been conceived by Jason and Freddy Kruger, and if Pinhead and the Cenobites were the official judges. The events are grueling, and the penalties for mistakes are rather harsh. But that's just the way the girls like it. On such a huge planet, there are hordes of wild and dangerous creatures, as well as a thousand easy ways to get killed accidentally, such as falling off the edge of one of the continents and dropping into the great abyss towards the crushing center of Jupiter's mass. Historically, previous Great Chieftains of Jupiter tended to last around thirty years or so. Urania is the latest in a great and powerful line of Jovian rulers, and she earned it through a brutal contest against the worst her planet held, a process of natural selection and survival of the smartest and fittest. Her competitors received well-earned Darwin Awards, and nice funerals when the remains could be found. Her own family are a very hardy sort, built to wrestle dragons without magical help, to hack through hundreds of miles of jungle, and survive the worst poisons the local creatures can throw at them. Jovians in general are tall, muscular people with overblown attitudes about their own invincibility, and Urania came from a family whose prime ideal is that brute force can accomplish anything, and if it's not working, then that only means they need more brute force to succeed. Might makes right, and she is among the mightiest. On a hazardous world and in a very dangerous job, Urania has lived several times longer than the average. 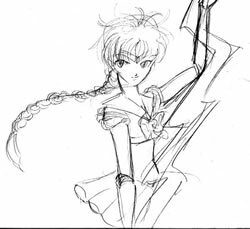 The elder Sailor Jupiter is an expert in hand-to-hand fighting, favoring a good punch over a long sword any day. Her kicks are pretty powerful, although Thalia considers the impact to be merely "cute". Her main advantage comes in the form of ultra-high-powered electrical attacks. They're not as precise as the lasers of Venus or as broad as the fire of Mars, but they pack a greater punch than both of them combined. She's not nearly as powerful as Sailor Saturn, but she can still take a fair amount of damage without flinching, as well as dish out the hurting to those she deems worthy of it. Her main disadvantage is in her lack of speed compared to the others. She has the tendency to miss faster opponents, and there seem to be a greater than average amount of monsters that can resist electrical attacks. and have him begging for more. She may not be as "pretty" as the other Senshi, but she gives off a very primal vibe, as one might imagine of someone who fights with and survives among great and dangerous beasts. She prefers to wear her long hair in a braid, and has Ryoga-style elongated canines. She could be summed up as a tall Amazon Warrior Queen. She's certainly capable of being the main character in her own Red Sonya-style comic book, given the opportunity, and it would be an autobiography!